"The Airlink is an express public coach that accepts Leap Cards. Without a Leap Card, it costs €6 one way or €11 return (when you buy online). Unlike other the regular public Dublin bus, you don't need exact change. Do be mindful that timetables are different on Sundays and public holidays. Airlink is also one the fastest ways to get to the city, as it uses the Port Tunnel, which runs under much of the north side of the city. The service runs 7 days a week from 4.45am to 00.30am up to every 10 minutes. 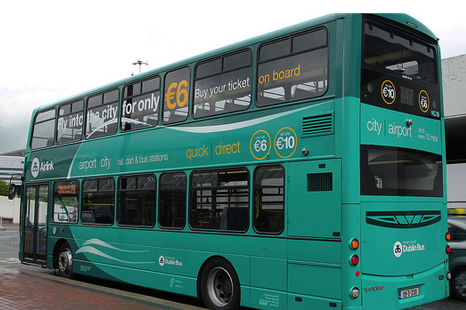 Many would consider the Airlink bus the best way to get from Dublin city centre to Dublin airport, in terms of speed and affordability. For those staying slightly more central in the city, the 747 will take you there. For list of stops and time tables check out http://www.dublinbus.ie/en/Your-Journey1/Timetables/Airport-Services/"
There is a stop at St. Stephen's Green, near our venue. Restaurant Suggestions: Please submit any favorites you might have and we'll post them. For a pub with architectural charm I enjoy the The Stags Head, 1 Dame Court. "This is probably Dublin's best preserved Victorian pub - and everything here is of authentic Victorian origin.Take time to look around and savour the sumptuously carved Victorian mahogany fittings, the mosaic marble tiled floors and granite tabletops. Visiting the Stag's Head is a wondrous experience wether you call when the premises is cosy, warm and glowing at night time, or in early morning when this is old repository of liquid culture is radiantly illuminated by wafts of sunlight filtering through the stained glass windows.The mahogany bar, capped with red Connemara marble, follows the classic Victorian architectural pattern, being long and punctuated by exquisite partitions that divide into private compartments or stalls. Though a tavern has existed on this site since the 1780's, this premises first attained great fame in the 1830's as 'John Bull's Albion Hotel and Tavern'.This was one of the most sought after premises of the age in close proximity to 'Dublin's Theatreland' and the fashionable stores of Dame Street and College Green.A popular music hall business was developed on the site, a trend continued by proprietors Alica and Henry Murphy during the 1840's.William Wormington succeeded them here in the 1860's and James Kennedy took the reins in the 1880's. 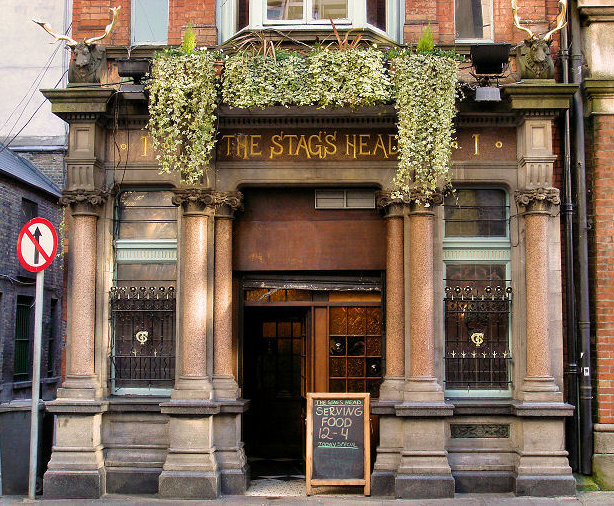 The Stag's Head was the brainchild of Westmoreland merchant George Tyson who came to Ireland in the 1870's and established a thriving Menswear and Haderdashery business in Grafton Street, from where he was appointed 'outfitter and shirtmaker to the Lord Lieutenant'.He acquired this premises in the early 1890's and commissioned leading architect J.M. McGloughlin of Pearse Street to build Dublin's most advanced and distinctive Victorian pub - and the first in the Capital to enjoy electric light.The new creation opened its doors to the Dublin public in May 1894 amid majestic fanfare and distinguished patronage including the Lord Lieutenant and the most respected members of contemporary Victorian society.Tyson's name is still to be seen on the large clock on the outside of the building. Another outstanding vestige of this era is the little parlour lounge discreetly situated behind the main bar; in former times this area served as a fashionable Victorian smoking room." Not far from our venue is The Cellar Bar & Restaurant in the Merrion Hotel, Upper Merrion Street. 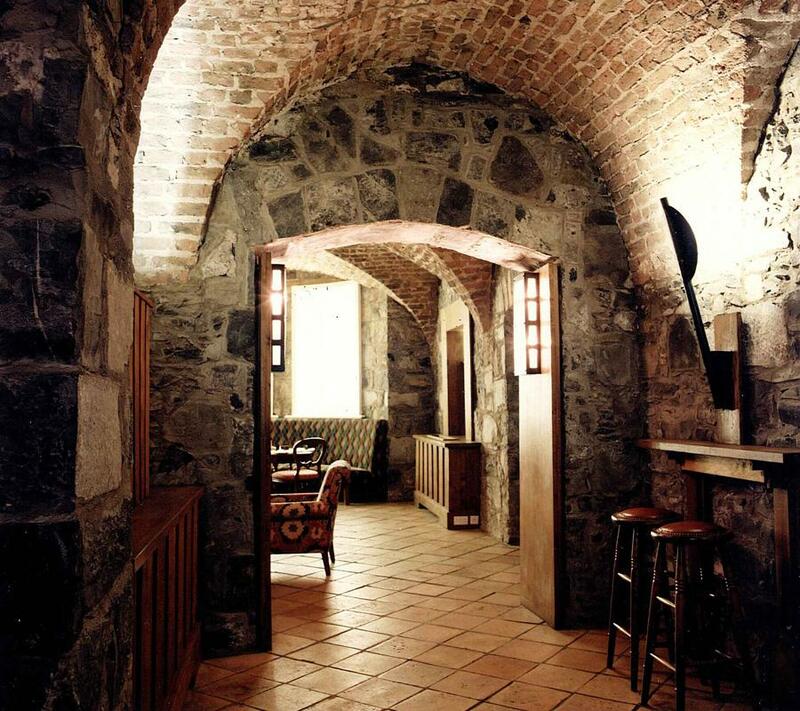 "Located in the original 18th-century wine vaults of the Main House, a warm welcome awaits in the oak-lined Cellar Bar. A popular lunchtime and after-work meeting place for Dubliners, the Cellar Bar offers a relaxed ambience and an all-day gastro-pub menu. Along with a full bar service, carefully selected wines are available by the glass. Great service and a convivial atmosphere make the Cellar Bar an ideal choice for lunch, dinner or just a quiet pint." "Unchanged for three centuries, this perfectly preserved library of the early Enlightenment, with its original oak bookcases, houses more than 25,000 rare and fascinating books. The library is open to the public and children are particularly welcome. Scholars may consult our holdings by arrangement." 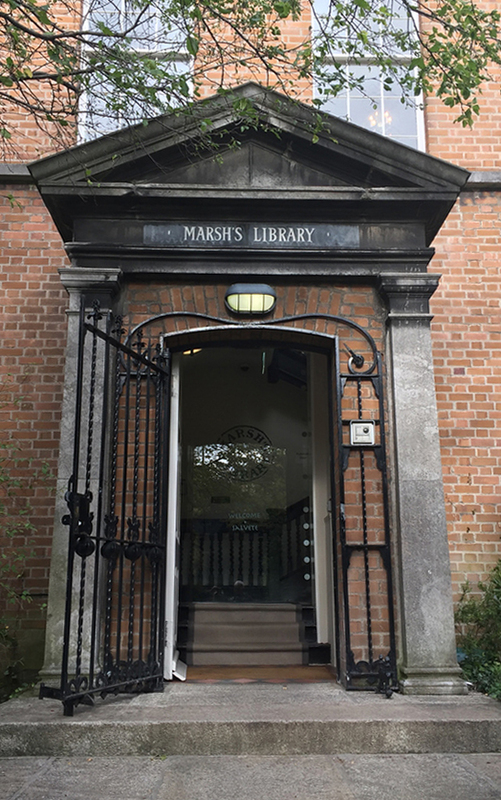 "The mission of the Library is to collect, preserve, promote and make accessible the documentary and intellectual record of the life of Ireland and to contribute to the provision of access to the larger universe of recorded knowledge. The National Library is open, free of charge, to all those who wish to consult the collections. You will need a Reader's Ticket to consult most categories of material. We do not lend books and reading is done in the various reading rooms. We have a copying service and it is possible to get digital images, prints and photocopies of most items in the collections. The Office of the Chief Herald and the National Photographic Archive in Temple Bar are all part of the National Library. The Library has a lively programme of exhibitions and events for all ages." 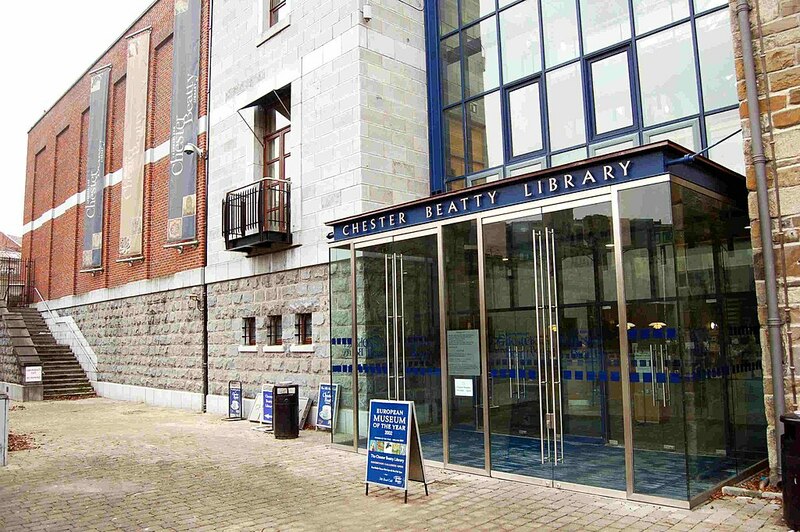 "Described by Lonely Planet as 'not just the best museum in Ireland but one of the best in Europe', the Chester Beatty is the pre-eminent Irish museum promoting the appreciation and understanding of world cultures. An engaging and welcoming space, visitors from Ireland and overseas will find permanent and temporary displays, an intercultural learning programme and a broad variety of public activities for all ages and backgrounds. The Chester Beatty also reaches out to the culturally diverse communities in Ireland. By drawing upon and interpreting the wonderful collections, the museum actively engages with the newest members of our society. It is also a research library for scholars from all over the world." 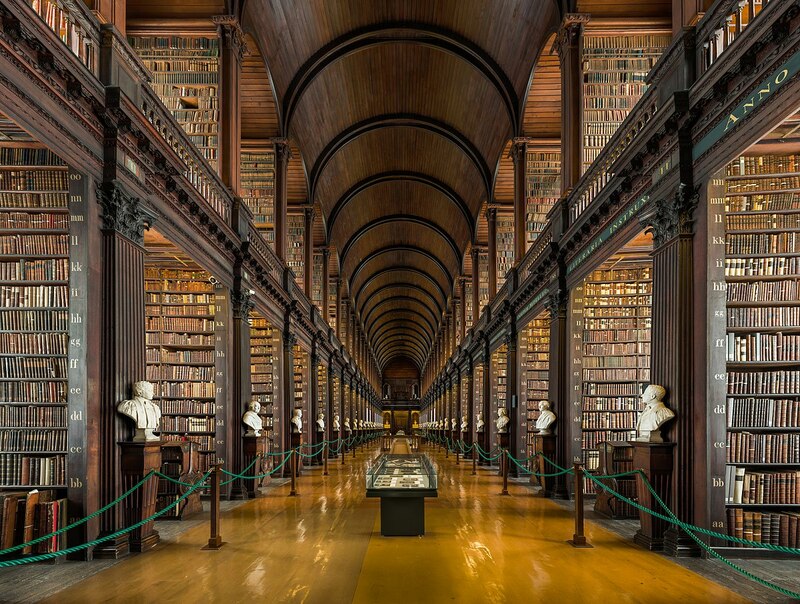 "The main chamber of the Old Library is the Long Room; at nearly 65 metres in length, it is filled with 200,000 of the Library's oldest books and is one of the most impressive libraries in the world. When built (between 1712 and 1732) it had a flat plaster ceiling and shelving for books was on the lower level only, with an open gallery. By the 1850s these shelves had become completely full; largely as since 1801 the Library had been given the right to claim a free copy of every book published in Britain and Ireland. In 1860 the roof was raised to allow construction of the present barrel-vaulted ceiling and upper gallery bookcases. Marble busts line the Long Room, a collection that began in 1743 when 14 busts were commissioned from sculptor Peter Scheemakers. The busts are of the great philosophers and writers of the western world and also of men (and yes, they are all men) connected with Trinity College Dublin - famous and not so famous. The finest bust in the collection is of the writer Jonathan Swift by Louis Francois Roubiliac. 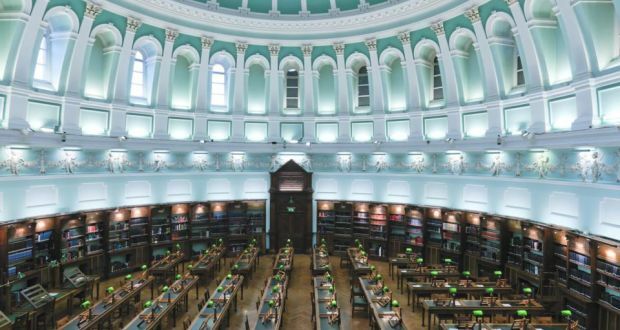 Other treasures in the Long Room include one of the few remaining copies of the 1916 Proclamation of the Irish Republic which was read outside the General Post Office on 24 April 1916 by Patrick Pearse at the start of the Easter Rising. The harp is the oldest of its kind in Ireland and probably dates from the 15th century. It is made of oak and willow with 29 brass strings. It is the model for the emblem of Ireland." It's unclear whether the Long Room can be visited free-of-charge. The Book of Kells is nearby in the same building and it may be that one can only visit the Long Room if you combine it with the Book of Kells. To see the Book of Kells you must pay €11-14! "Established in 1983, Chapters Bookstore is an independent Irish bookstore that had its first home in Wicklow Street, Dublin. 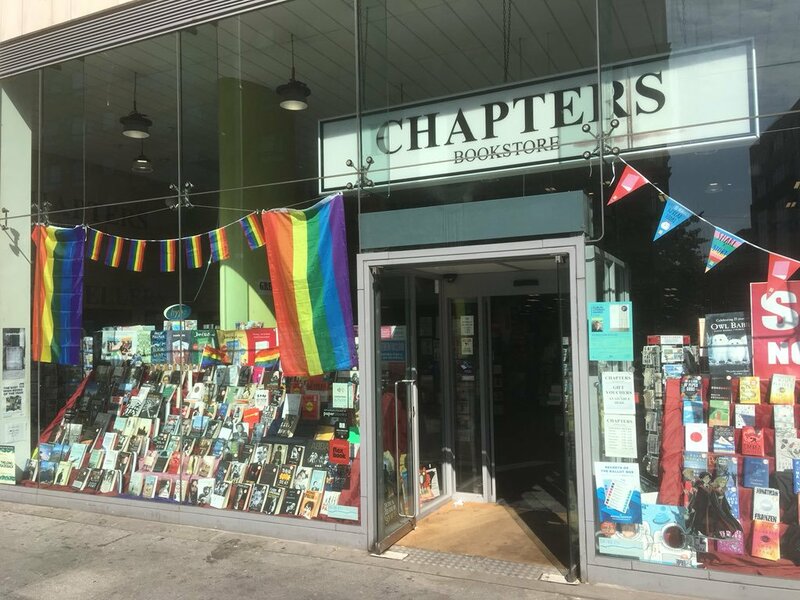 Since then, Chapters has moved from Wicklow Street to St. Stephens Green, Henry Street to Abbey Street until opening the largest independent bookstore in Ireland on Parnell Street in 2006, our current location. Housed on two floors Chapters sells an extensive range of books, music and DVDs, both new and secondhand, as well as thousands of bargain priced titles. Previously owned books, CDs and DVDs can be bought and sold in our secondhand department, and we offer cash or store credit. At Chapters our staff are fuelled by a love of books. We endeavor to provide value, quality, and friendly service to all of our customers." 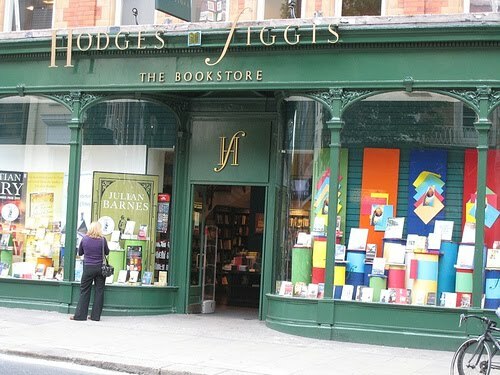 "From 10 Skinner's Row in 1768 to 56-58 Dawson Street in 2015, Hodges Figgis has been�an essential element of Dublin's cultural tradition for years. For ten generations our customers have recognised the importance of a complete and personal service. Our Irish Department represents the largest stock of books relating to Ireland to be found anywhere in the world. Within our walls can be found books of all genres, from Fiction to Philosophy and Cookery to Children's. The Academic floor has supplied generations of students in all disciplines, and is where our Account Sales Department can also be found."